5G is becoming more than a buzzword as we look to 2019, with the first 5G smartphone being unveiled at a conference today in Hawaii. There's one problem: you won't be able to buy this device today – or ever. It's a Qualcomm reference handset, meaning it's simply here to provide a roadmap for companies to use Qualcomm's technology in their own devices down the line. The good news is that we'll see the first 5G capable phones in early 2019, according to Qualcomm at its Snapdragon Summit. Samsung and OnePlus, among others, are expected to launch 5G phones, with carriers like AT&T, Verizon, EE and others around the world supporting the faster technology. If you made a drinking game out of their use of fluffy buzzwords, you'd be drunk. That's going to start changing when 'multi-gigabit connectivity' and 'millimeter wave spectrum' start meaning something to general consumers. They'll translate to faster speeds, consistent connectivity, longer signal range, and having that all important 5G logo at the top of your phone notification tray. 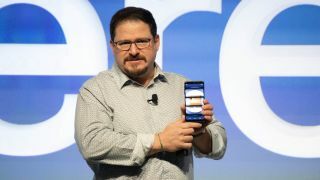 "2019 will be the 5G launch year," according to Qualcomm President Cristiano Amon, who mentioned that AT&T and Verizon are currently outfitting Maui in 5G for the Snapdragon Summit ahead of a wider commercial rollout in early 2019. Verizon, for example, has been able to provide 1GB per second speeds up to 3,000 feet away, showing that 5G is much more resilient than than 4G. AT&T sees these same reliable 5G speeds as the future of immersive entertainment and education, including powering your virtual presence. Get ready for hologram chat. Enterprise will be the first sector to see big benefits from 5G by way of cost savings, according AT&T. 5G will provide efficiency to broadcasters, manufacturers, service industries, and retail businesses, noting that the carrier "expects the first uses of 5G to create new business models." Verizon is promising two exclusive 5G phones in early 2019, and also a 5G mobile hotspot from Inseego. And that's just one carrier out of hundreds around the world. The specific names of these devices elude us right now. What we can tell you is that we fully expect every major Android phone to have the newly announced Snapdragon 855 chipset and support 5G. This is likely to be in the Samsung Galaxy S10 first and then launch in other rumored phones like the LG G8, Moto Z4, Samsung Galaxy Note 10 and Google Pixel 4. It's when these devices launch that we'll be able to see if 5G lives up to its decade-long hype. And then we'll start hearing the inevitable build up of buzzwords about 6G.